During my time in Chile, I’ve been working on a new survey. The Valparaíso ALMA Line Emission Survey (VALES) is a sample of main-sequence and starburst galaxies selected from the Herschel Astrophysical Terahertz Large Area Survey (H-ATLAS). The idea is to characterise galaxy populations at “intermediate” redshifts to act as a reference for future studies at higher redshifts. Although the survey will be predominantly based on observations of spectral line emission with the Atacama Large Millimetre/submillimetre Array (the ALMA in survey name), we are also pushing an observational campaign using APEX/SEPIA, VLT/MUSE, etc., to obtain both integrated measurements and high spatial resolution maps of various emission lines. Fun fact: the survey was almost called the Herschel-ALMA Intermediate Redshift Line Emission Spectroscopic Survey, but this suggestion was too bald. Ahem. We present the ALMA Band-3 CO(1–0) observations for the first time, using them to study the molecular gas content in a sample of 67 normal star-forming galaxies. After describing the data reduction process, we calculate CO luminosities, the optical to CO size ratio for the spatially-resolved galaxies, the global Schmidt-Kennicutt relation, and study the gas content and star formation efficiency as a function of redshift. As the paper was only just submitted, I’ll write more on this later. This paper, now accepted for publication and available on the arxiv (see also the talk I gave at this year’s SOCHIAS meeting), studies the physical conditions in the interstellar gas via the comparison of the ALMA CO(1-0) and Herschel [CII] observations to a photodissociation region (PDR) model. We determine the gas density, surface temperature, pressure, and the strength of the incident far-ultraviolet (FUV) radiation field. 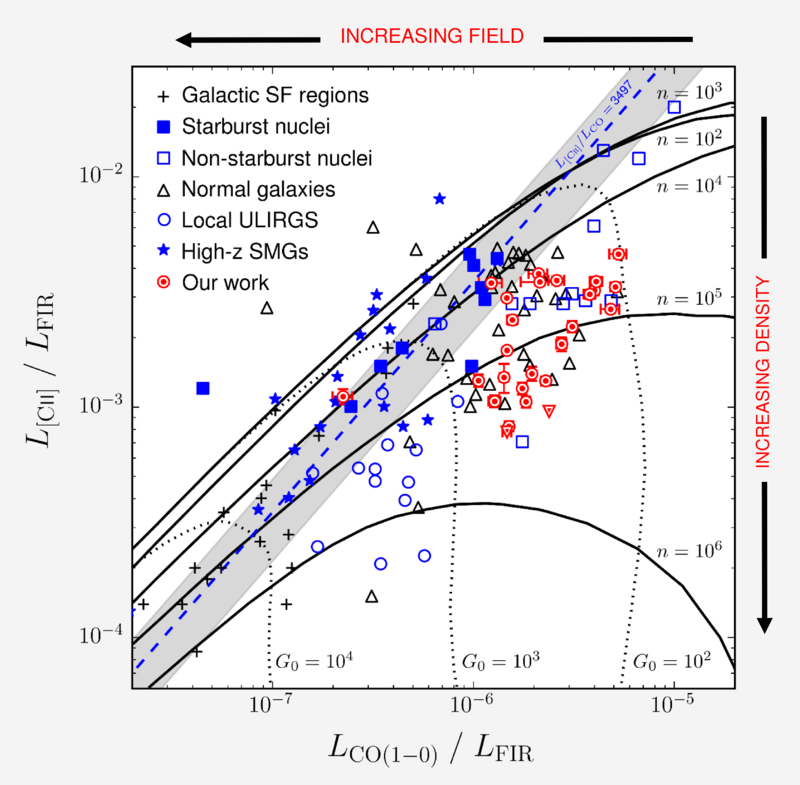 The majority of our sample exhibit hydrogen densities and experience an incident FUV radiation field with strengths (when adopting standard corrections) that are consistent with local, normal star-forming galaxies and non-starburst nuclei. A comparison to galaxy samples at different redshifts indicates that the average strength of the FUV radiation field appears constant up to redshifts z~6.4, yet the neutral gas density increases as a function of redshift by a factor of approximately 100 from z=0 to z=0.2 (quite an intriguing result) that persists regardless of various adjustments to our observable quantities. Whilst this evolution could provide an explanation for the observed evolution of the star formation rate density with cosmic time, I think the result most likely arises from a combination of observational biases when using different suites of emission lines as diagnostic tracers of PDR gas. The interesting part to this, though, is that whichever way you make the comparisons to avoid the biases (VALES versus the low-z sample, or VALES versus the high-z sample), the increase in gas density with redshift seems robust. In this paper, I am presenting the calibration between the dust continuum luminosity and interstellar gas content obtained from current VALES sample of 67 main-sequence star-forming galaxies at 0.02<z<0.35. I’m using the ALMA CO emission to trace the molecular gas mass and estimating the dust continuum luminosity from MAGPHYS modelling of the GAMA Survey‘s far-ultraviolet to submillimetre spectral energy distribution (see example below). We then provide relations between continuum luminosity, molecular gas mass and total ISM mass for different combinations of the VALES and literature samples, and adopting two different values of the alpha CO factor (that converts the CO luminosity to a molecular hydrogen mass estimate). I’m pushing for these relations to be published in time for ALMA Cycle 5 proposal deadline, as they may be useful for estimating the gas content from the continuum emission from high redshift systems. This brief overview is just a taster of the first few papers that are almost ready to be released into the wild. There are many more studies possible given the quality of the data in hand, with more on the way. Watch this space!